Realistic Games are a relativity new slot machine game provider but now work with some of the biggest online casinos supplying a range of different slot machines. On this page we’re going to take a look at the payout percentages of those games you so you can see which Realistic slots are the highest paying offering the best return to players. At time of writing – in 2018 – Realistic Games’ portfolio of online casino games numbers of total of 67. Many of those games are of the online slots variety but there are also an impressive selection of both classic casino table games and so-called ‘pull tabs’ games. As mentioned above, many of the games developed and supplied by Realistic Games are online slots, and these titles are split fairly evenly between three reel and five reel alternatives. The three reel alternatives are generally a little simpler than the five reel games, but both categories possess a decent mix of more straight-forward games and games which incorporated additional features and bonus rounds. 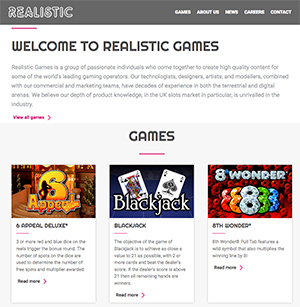 Realistic Games’ selection of online slots titles, too, comprise both licensed, branded games and games entirely of the company’s own creation. The former games are born out of a relationship between Realistic Games and BetVictor, and are slots themed around BetVictor’s ‘Million Pound Goal Promotion’ and around Liverpool Football Club (whose principal sponsor is Bet Victor). Realistic games the smallest range when it comes to return to player percentages (RTP%). Right at the bottom is one of their most popular titles Win Sprint at just 95.00% whilst at the top is Over The Rainbow coming in at 95.87%. To be honest it’s pretty disappointing that their highest paying game can’t do a little better than that! The average payout percentage on Realistic slots is 95.34% which when compared to other manufacturers sits right in the middle of the pack. Their certainly aren’t being generous with their payouts but at the same time they aren’t at the bottom of the pile either. If you’re looking for slightly more generous RTP on your games then check out either NetEnt or our page on the highest paying slot machines. ‘group of passionate individuals who come together to create high quality content for some of the world’s leading gaming operators’. Based in Reading, Berkshire, the company is by no means one of the largest within the global gambling industry but they do have an outstanding reputation – especially in the UK – and do indeed provide their products and services to some of the best-known gaming brands around. Paddy Power, William Hill, Betfair, Ladbrokes and BetVictor, for example, are all numbered amongst Realistic Games’ clients. To understand how a comparatively small company has come to work with such gambling goliaths, it is worth taking a look at the history of Realistic Games as a company. The story of Realistic Games begins back in 2002, when the company was first founded in Reading. At that stage, the online casino gaming industry was very much in its infancy and Realistic Games were able to get in on the ground floor by producing high quality games and related content to supply the newly developing online casinos. Between the company’s foundation in 2002 and 2008, Realistic Games created largely traditional casino table games for the online gambling industry, including the likes of roulette, Hi Lo Gambler and La Boule. Those early Realistic Games titles were supplied to the likes of Ladbrokes, Bet 365 and the then Victor Chandler, but were all provided via third party platforms. In 2008, Realistic Games came to the conclusion that such third party provision was not good enough, and meant that their clients were not getting the best out of the content which they were supplying. For the next two years or so, therefore, technical experts at Realistic Games began developing what the company would come to call the Realistic Games Library (or ReGaL for short). ReGaL is Realistic Games’ own remote game server and became the distribution mechanism for all of their content after its eventual launch in 2011. Stan James become the first client of the company to launch on ReGaL and many other household names of the online gambling industry would soon follow suit. The development of ReGaL wasn’t the end of Realistic Games innovation within the gaming field, either. In around 2011/12, the company became one of the very first gambling software suppliers to begin producing HTML5 mobile casino content. That saw the company launch high-quality table and slot games for a mobile gambling industry which was only just starting to take off at the time. In the ensuing years, Realistic Games has continued to broaden the portfolio of games and software it provides, and has also seen their mobile, tablet and desktop content launch with the likes of Paddy Power, William Hill, Coral and Betfair. ‘efforts are geared to providing fair and entertaining game play with functionality that is always familiar to players’.